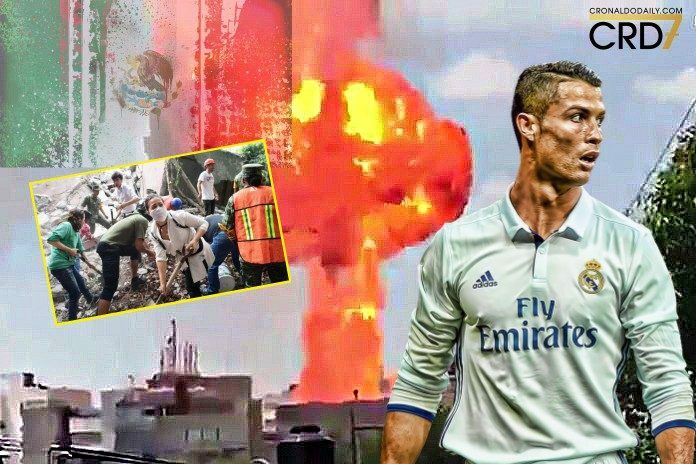 Cristiano Ronaldo, among other top celebrities, has sympathized with Mexican natives on the devastating earthquake that has left the nation in sorrow. The powerful 7.1 magnitude incident struck Central Mexico and is reported to have killed over 200 citizens. Over 40 buildings have collapsed in the nations capital, Mexico City. The heartbreaking disaster is the most powerful upheaval since one which hit the city in 1985, killing thousands. Cristiano’s sister Katia Aveiro also posted to her 398,000 followers: “My heart is with Mexico,” she added. Close friends of the Portuguese icon also joined in wishing the nation well. Check the posts below: Jose Semedo and Miguel Paixao asked for the world to pray for Mexico. The world keeps showing concern to the 130 million populated nation and it’s a bitter moment for Cristiano Ronaldo fans who were eager to witness the celebrity’s return in La Liga against Real Betis. We at C. Ronaldo Daily extend our sympathy to this lovable country and CR7 fanatics in Mexico. Ivan is a young Ghanaian football journalist. He is a staunch fan of Real Madrid C.F. and sports in general. He discovered his unique admiration of Cristiano Ronaldo during the player's early days at Manchester United. Ivan was captured by the skill and personality of the then young Portuguese lad who showed so much confidence at such a big club. He is also a big fan of Cristiano's antics both on and off the pitch as controversies make this player what he truly is. Ivan usually spends his leisure time reading, watching sports documentaries and ancient story movies. He describes himself as a person who is always ready to learn at any opportunity and likes to have fun as well.